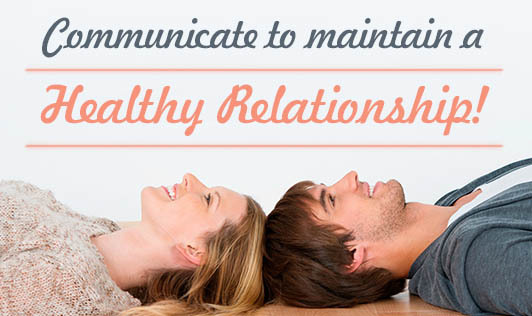 Communicate to maintain a healthy relationship! Effective communication is the key to every healthy and successful relationship. Communicating with your partner regularly is important to be able to understand each other. Communication either makes or breaks a relationship. If you want to improve your relationship with your partner, here are a few tips to consider! • Talk face-to-face. Avoid talking about serious matters in writing, letters or text messages as these can be misinterpreted. • Be honest with your partner. Sometimes, truth hurts but it is also essential for maintaining a healthy relationship. Apologise and admit your mistakes without making excuses. • Take time out daily to discuss various events of your life and ask for your partner's support if you need it. • Avoid ego and don't take things too personally. • Listen to what your partner has to say. You both deserve the opportunity to express how you feel. • Think about the situation and figure out the real problem and then think about how to explain your feelings. • Choose your words carefully during an argument. • Pay attention to non-verbal signals such as your body language, the tone of your voice, eye contact and so on. • Don't focus on winning when you are discussing something with your partner. Communicating with your partner may not always be easy. Some of the tips given above may feel unnatural, but these will help you communicate better with your partner and strengthen your relationship!